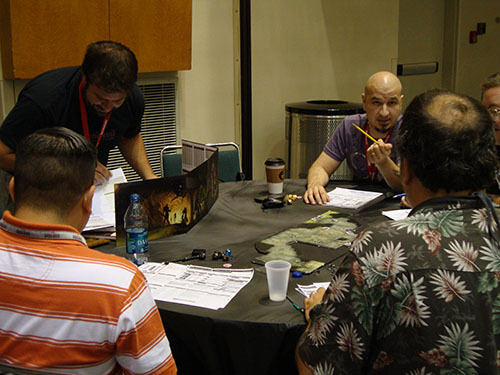 One of the things I was looking forward to doing at Gencon was DMing my first game in public. You see, I’m not a great public speaker, in fact, I’m pretty terrible. I don’t do well in public arenas, and I’m very self conscious about my DMing abilities. Sure, I’ve DMed for some online friends here and there, but it’s not the same as when you are staring at a table of strangers at a convention. This isn’t Skype, this is face to face. It makes it a little harder when you’ve got a DMing blog, and perhaps people set their expectations a bit high. Unfortunate, but true. So I decided to keep things simple. I ran a 2nd level Chaos Scar adventure, straight from Dungeon Magazine. I didn’t tweak it or alter it in any way, I just ran it as is. If you’re interested, I ran the “‘Lost Library” adventure, as it includes iconic D&D elements like a small dungeon and a dragon. I felt that it was a good choice. 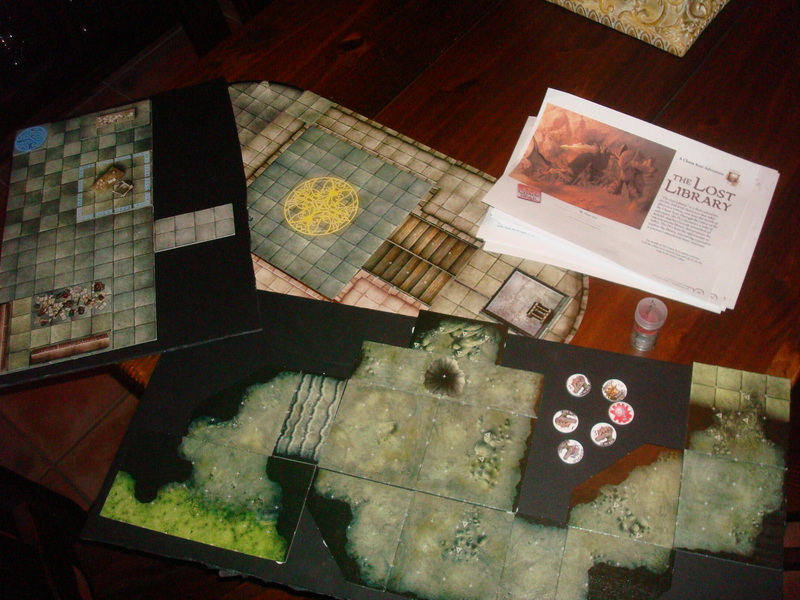 The Lost Library, with tokens and tiles. So what did I learn? Well, these things may help you out as you prep to run your first public game at a con or store somewhere. Have all your player’s contact information. Seems simple right? Well, I didn’t have it and it led to a bit of sitting around wasting valuable time. Make sure everyone has your cell phone number, email, or whatever to reach you at the venue, instead of having to walk around looking for you. Be prepared with supplies. You are the DM, and unfortunately, makes you a bit responsible for the table. Like it or not, sometimes our role gravitates that way. have plenty of pencils and scratch paper and such ready to go. Also, be ready to provide your players withe counters or minis for the game. if you don’t, and they don’t bring any either, you’ve made it harder on yourself. Have your maps pre-drawn or assembled. You’ll be surprised how much time that saves. Read, and re-read the adventure. Be comfortable with what you are running, even if it’s just a quick delve. I read that thing like 10 times, finding sports to add to the story a bit. I made one of the last bosses have a coughing attack every now and then. Not necessary to the story, but it adds a bit of texture to the guy. In the beginning, witnesses heard coughing at a murder scene, in the end, the players heard coughing at the last battle. That sort of thing adds a bit. Manage time expectations. Delves are meant to be run rather quickly, but be careful what you promise in terms of times. Our delve ran a bit long, and I’m not sure where that happened. At cons, players may be scheduled for other events, so be mindful of that as you play. When you wrap it up, gather feedback. Everyone wants to know how they did, so don’t be afraid to ask. It’ll only make you a better DM. Try to help as much as possible. Don’t be frustrated by newbie players, but rather help them out as you play. That’s part of the role. Embrace it, or specify when you are setting it up that it is a game for advanced players. Have fun. Play it up. Command the attention of the table. Con gaming rooms can be loud. You want your players looking at you, paying attention to you, and enjoying what you prepared. You don’t want them distracted by the table next to yours. Make the adventure the focus. I had a great time playing, and if I go back to a con, I’m definitely running something again. If it’s 4e, it’s going to be in the heroic tier, as I feel it works perfectly for convention play. 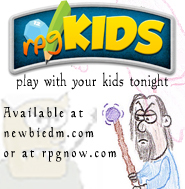 Quick, fast, fun, and iconic D&D. That’s what public gaming in a few hours should be about. That contact info bit is a great idea. 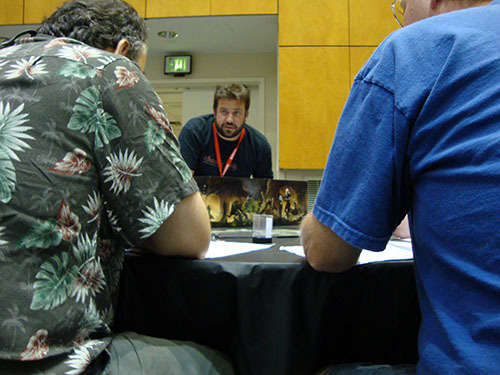 3 out of 3 D&D games I’ve played in were at a different table than the brochure said. Also, I had a great session last year with somebody who didn’t post his event till July this year. If I had had his number, I would have been able to call and ask if he was running another event this year. And then this year I was killed by a beholder, so with the DM’s contact info I can e-mail and ask how the session ended up. Great tips! 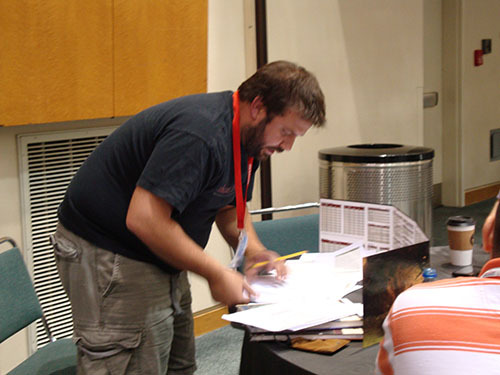 I ran three adventures at GenCon this year- one on wednesday for friends, 1 on Friday (via people I found from my blog) and I ended up stepping in to take over an LFR Open Play game on Thursday. I personally recommend a Paizo Flipmat and dry erase markers vice tiles, but I think these are great suggestions. I was one of the players in the game… My opinion? It was great! The story, the improv, the voices, the pre-made maps, and all the tokens were spot on. Thank goodness for Twitter though, else we’d not have figured out the exact location of the table when we did, that darn room that Wizards uses is huge, and I don’t know the total count of the tables there, but wow, I’m sure its in the hundreds. We played a delve, which had 3 full encounters, some Role-Play in it, some characters and powers we’ve never used as players, and fit it in under 5 hours of actual play time, more than likely it was around 4 cutting out distractions. Our sorcerer subdued a brown dragon, we defeated both of the main baddies. My swordmage fell unconscious at least twice, and it sure seemed the only rolls I ever made over a 12 or so, were my death saves at a natural 20, so I suppose if ever there were a time to roll a 20, that was it. Swordmage and Cleric ended up front-line defenders essentially, so all in all I think we did remarkably well. Also, pretty awesome to have James Wyatt stop by the table and recognize that we were all there playing with you as DM Enrique, really cool indeed. 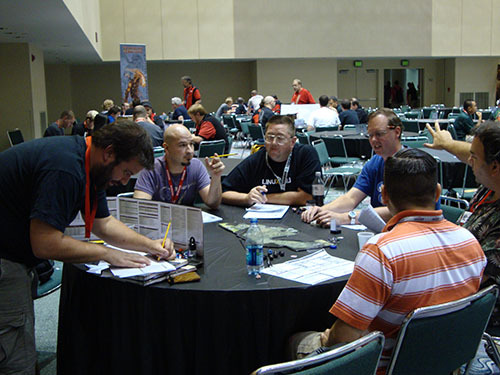 Anyway, thanks again for running this, I think this was my only D&D of all of Gencon, as I dropped out of my LFR event to do this, and I do not regret that at all, I’m confident that I had a much better time playing in your game, it was super fun. Well, a couple of weeks ago I ran my first time in public at the III RPG tournament here in Bogotá, and it was a great experience. I understand everything you point here because I make some of the same mistakes, like the maps and so. Well, another thing I’ll recommend is to have enough dices for everyone. It sounds simple, but sometimes none of your players have a d20 or simply are too new to the game so they don’t recognize the dices. If you make sure everyone have his/her own d20, and that everyone can distinguish a d10 from a d8, then your game will move faster. Also try to talk to another DM friend if you can about the delve/game you will run, because maybe he/she has another point of view and can help make a better game for everyone. Finally, never being afraid of the new players its highly recommended, what I learned that afternoon/night (it was from 11:00 to 22:00) was that most RPG players are nice people in a lot of ways and will understand you. Congrats on your first Convention Game! And while I didn’t get to play in your game, it sure looked like things were going very well from where I was watching from the sidelines. I’m a bit disappointed and jealous I didn’t get a ticket to play, but I’m sure there will be other chances to sit in on a newbieDM game session! I told you over there, I’ll say it again. You did great. You piloted this published adventure with professionalism and aplomb. I’m sure all the newbies had fun and I did too! We totally owned those bad guys! I was the assassin in the game and this delve was the highlight of the weekend! My fav part was the bar scene… You made that place come alive! The descriptions, the way you handled the mayor, the commotion outsidecwithbthe dragon born were spot on! Was not too familiar with 4e rules as all I’ve been playing has been Savage Worlds. I thought it would be similar to 3.0. Man, was I wrong! If you decide to run another one next year I would love to be a part of it again! I was looking at the photos and noticed that there weren’t terribly many visible “youngsters”. Most of the attendees seem to be at least in their late twenties. Is that just an artifact of the sample size, or was that age spread reflected at the Con in general? If so, might make an interesting reflection on WotC’s recent push for new players. 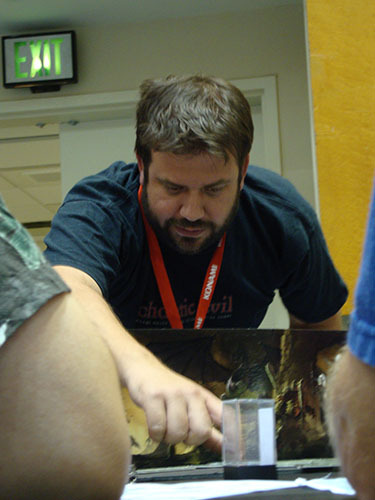 My first public game was running the 3e game for the ENW UK gathering at Gencon UK in 2002. That game ran long, so for 2003 I prepped a short bar room brawl, which naturally was over too soon. The 4e Heroic Tier Delves are nice in that with 3 encounters & 5-6 players they seem to predictably run for 3-4 hours of game time. When I run them in a 5-hour slot at the London D&D Meetup I normally add a 4th encounter.